The Construction Health and Safety Technician exam, commonly known as the CHST exam, is a comprehensive and challenging assessment for men and women looking to enter this challenging field of practice. The content of this assessment can be broken down into the following categories: project management, worksite auditing, training, and professional responsibility. The program management category comprises 29% of the exam. Within this section, there are questions about contract documents, contract specifications, and site-specific safety plans. The worksite auditing category comprises about 40% of the CHST exam. In this category, you are likely to encounter questions about specific protocols for monitoring and reporting safety violations at construction sites. In the training category, meanwhile, there are questions about learning the local building codes and regulations. This category accounts for 27% of the CHST exam. Finally, the professional responsibility category, which accounts for 4% of the exam, contains questions about professional responsibility and ethics. You should be conversant with all of the major codes of ethics before taking the examination. All of the questions on the examination have been written and edited by trained construction safety professionals, in consultation with testing professionals. The CHST exam was developed by the Board of Certified Safety Professionals. 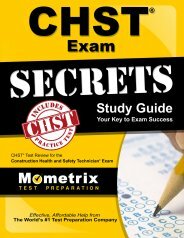 How to pass the CHST Exam! Ace the CHST test using our CHST exam study guide with practice questions. 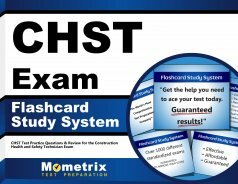 Quickly Solve Difficult CHST Test Questions with the CHST Flashcard Study System.